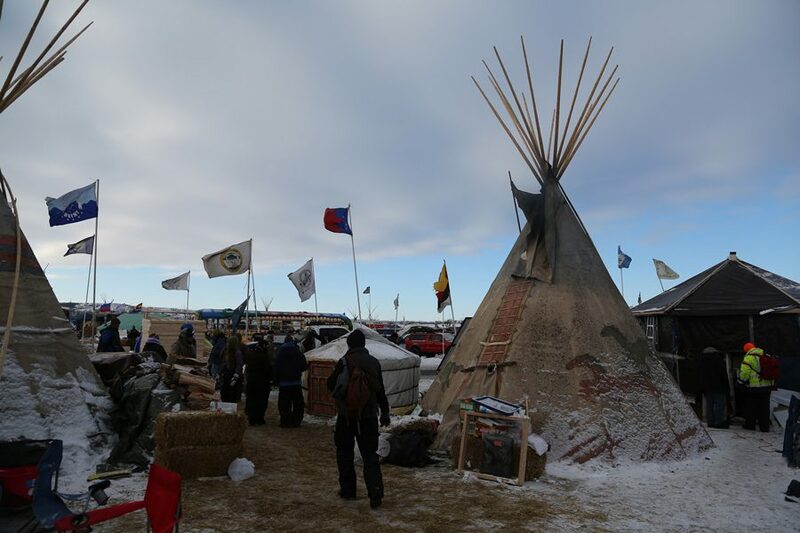 Thousands of Native Americans, veterans and environmentalists created an encampment in rural North Dakota to protest the proposed Dakota Access oil pipeline. Stacy Leeds, dean of the School of Law at the University of Arkansas, spoke about the pipeline conflict and other issues of Native jurisdiction at a Friday event. The status quo of indigenous communities has become increasingly “precarious” as their legal status of autonomy is continuously challenged, said a prominent Native lawyer at a campus event Friday. Stacy Leeds, dean of the School of Law at the University of Arkansas, formerly served as a justice on the Cherokee Nation Supreme Court. Leeds discussed the tension between tribal communities and the United States government on issues of autonomy and jurisdiction Friday at Harris Hall. A crowd of about 20 attended the event organized by the Colloquium of Indigeneity and Native American Studies. Leeds pointed to the controversy surrounding the building of the Dakota Access Pipeline, an underground pipeline running near the reservation of the Standing Rock Sioux — who protested the pipeline, which would endanger their drinking water supply and disrupt sacred sites. The project sparked mass protests from Native communities and their supporters across the nation, which Leeds said exemplified the predicament tribes face today. Leeds said the objections from indigenous communities stemmed not only from fear that a pipeline leak could contaminate the water sources nearby, but also from discontent with the state’s encroachment on tribal treaty rights. In August 2016, the Standing Rock Sioux Tribe sued the U.S. Army Corps of Engineers, which approved the Dakota Access Pipeline project to go near the Lake Oahe reservoir, for commencing work without adequately consulting tribe members in violation of the National Historic Preservation Act. The legislation stipulates the need to consult impacted tribes before starting projects on tribal land. However, she noted that land under the proposed pipeline doesn’t legally belong to the tribes despite their proximity. Consequently, the groups had “no legal say” over whether the construction work was legitimized, she said. Treasurer of the Colloquium Alissa Baker-Oglesbee told The Daily the organization invited Leeds as a guest speaker to join the collective movement of “national building” fueled by indigenous people across the country. The Dakota Access Pipeline conflict helped bring t the narrative of Native Americans to light, whose voices are often neglected by the mainstream, she said. Baker-Oglesbee also cited the approval of the Indian Child Welfare Act of 1978 as a landmark effort to maintain “cultural commonalities” between Native children removed from their tribes — 75 percent of whom she said were placed in foster care — and their tribal communities. The law requires a preference be given to a member of the child’s extended family or tribal member in adoptive placement of Native children under state law. The indigenous community has historically struggled with Congressional law related to tribal courts’ jurisdiction over criminal cases, Leeds said. However, changes have been made recently that “wouldn’t even be thought possible” in the past, she said, like 2013 updates to the Violence Against Women Act. Prior to the 2013 amended version of the law, tribal courts possessed civil jurisdiction but no criminal jurisdiction in handling litigation that involved non-members. After the act was reauthorized in 2013, tribal courts are now recognized in dealing with non-Indian perpetrators of domestic violence situations in certain circumstances. Postdoctoral fellow Sarah Dees said besides the “negative and lasting effects” caused by federal assimilation policies, she appreciated that Leeds mentioned revisions of Congressional law that seek to address indigenous governance.